When this face-down card is destroyed and sent to the Graveyard, Special Summon 1 "Wicked Token" (Fiend-Type/DARK/4 Stars/ATK 1000/DEF 1000) in Attack or Defense Position on your side of the field. the worst. 3 ... average. 5 is the highest rating. infinitekhaos This card reminds me of Avatar of Aphoaphis...except this is much more watered down. You need to wait for this card to be destroyed to get the effect. The effect itself isn't even all that great either. I suppose you can combo it with token thanksgiving...but this card is just so terrible. Maybe you could use it as MST bait, then use the token to tribute or something. You can't even chain this to Jinzo, (call, premature, reborn). Keep this card in your binder, or with your toilet paper. Closing Line - PLEEEASE MST THIS SO I CAN HAVE A USELESS TOKEN TAKE UP SPACE ON MY FIELD!! ExMinion OfDarkness NOTE: For all CotDs, please don't crucify me for using Magic instead of Spell. IMO, they're interchangeable. This is an underrated little card from PGD that's worth a second look if you're in a heavy M/T destruction environment. If your opponent kills this card, then you get a free monster. It can be tributed, it can attack, and its stats are passable. This really isn't that bad of a card, as most competitive players play 3 Mystical Space Typhoon and Harpie's Feather Duster, and at least half of the players who use those also use Heavy Storm and Breaker the Magical Warrior. In short, if you set the card, you'll most likely get to use it. Another plus is that this card still works if Jinzo is on the field. Why? Graveyard effect. For the same reasons that Witch, Sangan, Vampire Lord, and the like get their effects if Skill Drain is out, this card will still give you that token if destroyed while he is out there. Now for the bad points: You are getting a monster, but only 1000/1000. It most likely won't survive until the next turn. That, or your opponent will play their Heavy Storm or Harpie's Feather Duster, you get your monster, then they play Raigeki or Dark Hole...that's a very common play in Yu-Gi-Oh: Getting rid of the Magics/Traps before the monsters. If you're playing a deck that involves getting to Tribute for a lot of your monsters, this may help you along. Otherwise, I wouldn't play this card. I would rather use tomorrow's card of the day instead of this one. In Limited, don't bother. Your opponent most likely won't draft any Magic or Trap Removal cards (unless it's Sealed, then everyone will have an MST from the Pegasus starter) and you won't get to use it. Gambit This card is not so great, but is not without its strategy. The "Wicked Token" does not have bad stats for a token, but Scapegoat at least gives you 4. I see no real reason to play this, as it quite frankly isn't worth drawing in most decks So, you get the token... big deal, right? On the other hand, it is excellent bait for M/T removal -- most of your opponents won't be able to resist the temptation to destroy this card, only to find that they did exactly what you wanted them to do. And adding a semi-decent token that, unlike "Sheep Tokens", can be used for tributing, and that can see a little use in a Dark or Fiend Deck, is always worthy of trying out. Unfortunately, there are better cards for M/T removal bait, enough of them that this card just shouldn't find room in the average deck. 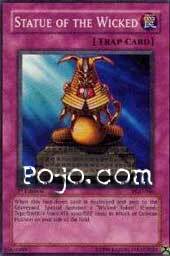 This card lacks the added bonus to give you reason to play it instead of Scapegoats, Waboku, etc. Rating: 1.0/5.0 Not entirely unplayable, but within spitting distance. This card is just basically an anti-M/T card. If it gets destroyed while face-down, you get a 1000/1000 token on your side of the field. Of course, that gives you field advantage, which is always a nice feature. However, this card has several problems built into it. The token's weak stats certainly hurt this card's playability. With only 1000 ATK and DEF, it will likely end up destroyed very quickly. Also, with all the monster removal (Torrential Tribute, Mirror Force, Ring of Destruction, Fissure, etc. ), it only shrinks the life of the token. Besides, there are several other chainable M/T cards out there (Ring of Destruction, Book of Moon, Waboku) so that you avoid having to play this card for the sake of baiting your opponent's M/T removal cards.